As the trial of Parmalat's founder Calisto Tanzi starts in Milan, BBC News Online has this timeline of the events that led to one of Europe's biggest financial scandals. 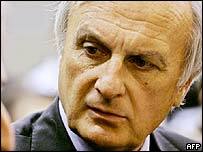 1961 -- Calisto Tanzi forms Parmalat after inheriting a small, family-run shop in Parma at the age of 22. 1990 -- Parmalat is listed on the Milan stock exchange. It has diversified from milk into biscuits, fruit juices, and pasta sauces, and has expanded abroad. 22 April -- Parmalat's share price reaches a record, valuing the company at more than 3.7bn euros (£2.5bn; $4.4bn). The company employs more than 30,000 people in 30 countries. 27 February -- Parmalat gives up trying to sell its 500m euros bond issue, citing unfavourable market conditions. The sale had raised questions about how the company was planning to pay back its existing debt. 6 March -- Italian fund managers ask to meet with company executives to discuss accounts. 28 March -- Chief Financial Officer Fausto Tonna resigns and is replaced by Alberto Ferraris. 12 September -- Parmalat drops plan for 300m euro debt sale. 11 November -- The company's shares are hammered amid questions regarding transactions with the Epicurum fund in the Cayman Islands. 14 November -- Mr Ferraris resigns and is replaced as chief financial officer by Luciano Del Soldato. 9 December -- The company misses a 150m euro bond payment and Mr Del Soldato quits. Enrico Bondi is called in by the government to help turn the company around. 15 December -- Mr Tanzi resigns as chairman and chief executive officer of Parmalat, and is replaced by Mr Bondi when the company goes into administration. 19 December -- Bank of America claims a document showing 3.9bn euros in off-shore affiliate Bonlat's bank account is forged. 20 December -- Fraud investigation is started as Prime Minister Silvio Berlusconi promises to safeguard jobs. 22 December -- Parmalat shares hit their lowest level, losing 97% of their value, and are suspended. The company is valued at just under 90m euros ($100m, £60m). 24 December -- Parmalat goes into administration. 27 December -- Mr Tanzi is taken into police custody as he returns to Italy from Spain. 30 December -- Mr Tanzi admits that the hole in Parmalat's accounts is about 8bn euros, though he denies ordering any cover up. He says top managers acted of their own accord, but does admit siphoning off about 500m euros from other Parmalat-owned companies. 31 December -- Police arrest five former Parmalat executives including Fausto Tonna and Luciano Del Soldato. 5 January -- Parmalat's new management prepare to meet with creditor banks to ask for money to keep operating. Police question former finance chief Fausto Tonna, alleging he helped construct a web of offshore bank accounts and holding. 8 January -- Accountants Grant Thornton expel their Italian partner firm because of its involvement in auditing Parmalat. Italian officials investigate accountants at Deloitte & Touche. 17 January -- Bank of America says it can find no trace of an account which a creditors' group had said contained about 7bn euros. 23 January -- Alessandro Bassi, former aide to Fausto Tonna, commits suicide. 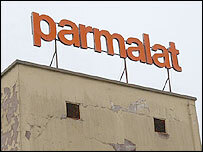 26 January -- Auditors determine that as of September 2003 Parmalat had debts of 14.3bn euros, almost eight times what management had claimed at the time. 6 February -- President of Parmalat's Brazilian business warns it is close to collapse. 17 February -- The son and a daughter of Mr Tanzi - Stefano and Francesca - are arrested. 18 February -- Calisto Tanzi is rushed to hospital with suspected heart problems. 24 February -- Parmalat USA, the firm's American subsidiary, filed for bankruptcy protection in New York. 28 April -- Parma football club, sponsored by Parmalat, is declared insolvent. 26 May -- Prosecutors call for 29 people, the Bank of America and Parmalat's two auditors to stand trial. 30 July -- Parmalat sues banking giant Citigroup, seeking damages of up to $10bn. 9 August -- Parmalat sues Deutsche Bank for $20m. 18 August -- Parmalat sues former auditors Deloitte & Touche and Grant Thornton International. 19 August -- Parmalat sues Credit Suisse First Boston for 250m euros. 7 October -- Parmalat files lawsuit against Bank of America. 29 October -- Bank of America and auditors Grant Thornton fight back against Parmalat and launch their own law suit claiming compensation. 16 December -- Parmalat widens its attack and sues 45 Italian and international banks. 25 January -- A court rejects compensation claims by the Bank of America and Grant Thornton. 3 February -- Parmalat reports a doubling of fourth-quarter pre-tax profit to 77m euros from a year earlier. 27 May -- Italy's financial markets regulator Consob gives permission for Parmalat to relist on the stock exchange. 23 June -- Morgan Stanley agrees a 155m euros settlement with Parmalat relating to a 2003 bond deal. 25 June -- Prosecutors charge 16 people, including Calisto Tanzi, over their roles in the collapse of Parmalat. 28 September -- Trial of Calisto Tanzi and 15 others starts in Milan.